Though we hate thinking about it, or talking about it, death is very real aspect of our lives. We encounter it every day, and one day we might just find it thrust into our lives when and important figure in our life perishes. In fact, you might find yourself in a situation like this right now where you have to be planning a funeral or cremation service for your loved one. However, are you in doubt about which to choose, or just unsure about what you should expect when planning a funeral or cremation service? Then this article is perfect for you! We’re going to look at ways how you can prepare for a funeral or cremation service. Educate yourself on the options you have – One big mistake that families often make is to assume that there’s only one way to go about planning a funeral or cremation service. However, that’s the farthest thing from the truth; you have myriads of options. It’s always great to know just the amount of flexibility you have when it comes to honoring your loved ones and just how touching you can make their service. Involve as much of the family as possible – We all know that the death of a loved one dredges up a lot of emotions, including ones that we tried to hide while the person was alive. Therefore, it would be prudent to involve as much of the family as possible in the funeral or cremation service. That way, nobody feels left out and the ceremony can take place as orderly as possible. In some cases, involvement can mean including pictures of as many family members as possible in the funeral program. Always ask about the cost of the proceedings – It’s your money being spent ultimately, so you should never be afraid to query prices or ask for the prices of various funeral or cremation packages or even to shop around. There’s a common notion that funerals and cremations should have to be expensive or break the bank, but that isn’t so. You’re entitled to the opportunity to pick, choose and refuse when it comes to the price to pay for the funeral package of you loved one. If you think something is too expensive, don’t hesitate to see if you can find it somewhere else for less. Make use of payment arrangements – Even though some funeral packages cost considerably less than others, one thing to note is that they aren’t cheap and can seem like an insurmountable expense – especially if the death was sudden. Therefore, most funeral homes offer payment plans and arrangements. Be sure to take advantage of these, as they can save your pocket and having to face debt for a long while after your loved one has been laid to rest. Never rely totally on insurance – Insurance usually just provides you with a lump sum when a death happens; however if not wisely spent, this lump sum can prove to be insufficient when it’s needed the most to cover death expenses. Be sure to converse on a method of final disposition – The way your loved one is going to be laid to rest is important, no matter which way you look at it. There’s a lot to consider when it comes to your loved one’s funeral and although proper planning can’t take away the grief that comes from having to experience the pangs of death, it can help to ensure that things go decently and by arrangement. Another thing that can help you to save money is by utilizing independent sources to provide you with funeral programs and funeral program templates! Our company does just that, and allows you to have a stylish, affordable and high quality program as a keepsake of the solemn event. Your loved one deserves to have the best! 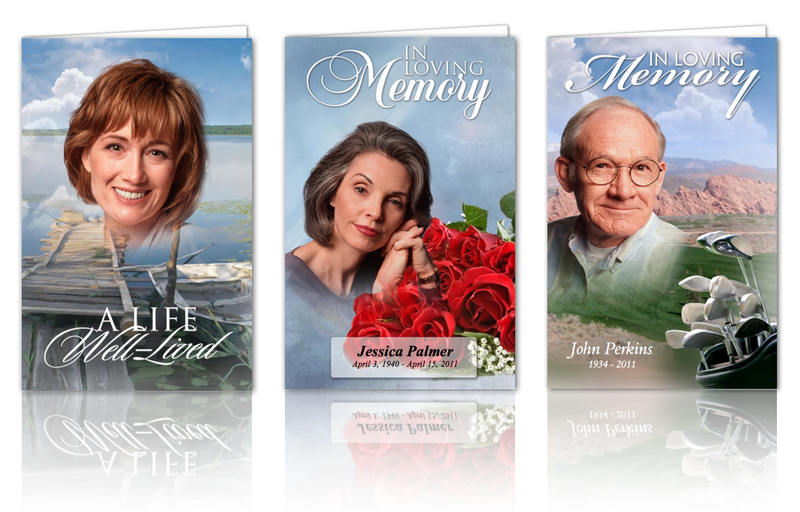 Create Funeral Program Crads, Obituary cards online using Drag Drop Card Designer. 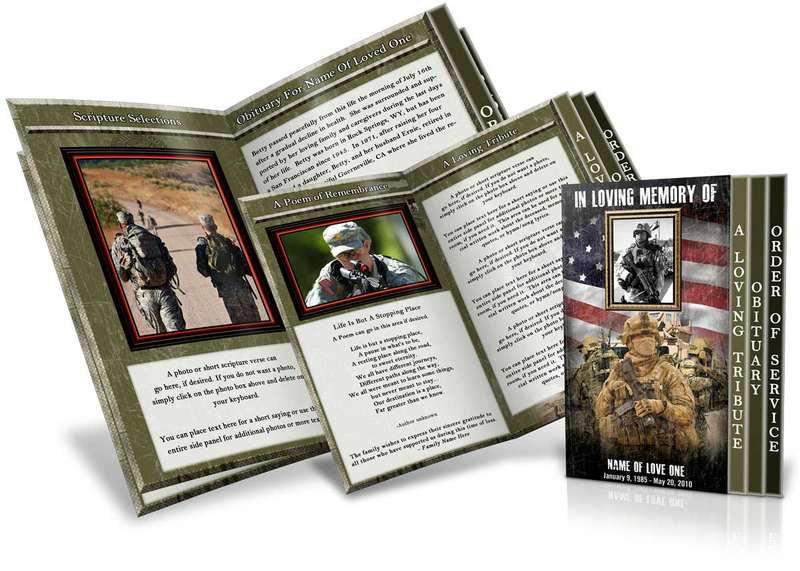 Here you can free choose number of funeral poems, funeral sentiments, funeral ornaments to create a Loving memory funeral cards. No Design skills required. No other software required. Just Customize online and get PDF downloaded ready to print.